What’s so important about music and movement activities in early years? We know that movement is a natural part of being human but what about dance? What about music and movement activities? Are we all supposed to be dancers -moving around to music? Is that a concern of early childhood educators when there’re so many things they have to program? I say a resounding yes! In the traditional past we humans danced the world we experienced: – the lizard, the crow, the salmon, the snow. In the here and now, we still do: we dance the lizard and the brolga, the crocodile and the land-rover; we still dance the courtship, the crop-blessing, the rush of spring energy, the farewell and the return; in modern dance, music clip and television advertisements, we move to the pleasure of geometric shape, the joy of getting a new mobile phone, the win at the races and a trillion other ideas and feelings. And many of us dance around our homes when music carries us away! Is it possible to dance without moving? We might actually take a philosophical stance and acknowledge the “inner dancer”. (I’m dancing on the inside!) Of course we consider this funny because of cultural constraints that often work against dancing, basically that we should only dance publicly if we are very good at it, (and the same goes for singing). Let’s be aware that a child with severe disability restricting her movement may gain a lot from being around “dancing people” – in the company of dancers – dancers who are connecting with that child’s “inner dancer” at a subtle level of communication. What I’m getting at is that there is a part of dancing (and indeed moving) that is intentional – arising from intentions in the mind. We do actually dance on the inside. We can learn to be precise and expressive in our everyday movement through music and movement activities. It is possible, and more likely in fact, to move without dancing. Most of our waking time is concerned with movement, in fact we are rarely still. And most of that movement is not dance, until it gets into the choreographic brain of a brilliant dancer such as Meryl Tankard who makes wonderful dances out of everyday movements. She turned some of those ideas into the reality of the Sydney Olympic Games Opening – Deep Sea Dreaming. But a footy game is all movement and hardly anyone considers it dance, and soldiers crawling through trenches are moving and that’s not dance and so we can go on and on. Hardly any of our movements are dance –especially in our working lives. However, we do need to be skilful movers in all of these non-dance movements and that’s part of the value of dance. We can learn to be precise and also expressive through dance. I think that’s a gain for society. Of course we also need to just dance for the sheer pleasure of it too! You want to gain a deeper understanding of the important role you play in your children’s music and movement activities. How can you apply the very best educational practices so that the young children in your care may learn how to effectively and expressively move and dance to music? To start, you need to undertake a careful consideration of your own attitudes, dispositions, self-concepts, about these very personal things – how you move and how you dance. Hopefully you are willing to tell yourself how good you are at these skills and discard attitudes that stand in the way of you being an inspired and brilliant educator! If you love to dance when you celebrate, if you feel like recoiling in horror when you hear something bad or jumping for joy when you win then you’ve got everything it takes to organise music and movement activities for your children. You can read Howard Gardner’s Theory of Multiple Intelligence for yourself. With Gardner’s theory in mind we can think about movement as organised by thought or as arising as thought in its own right — spontaneously, and that spontaneity is the very stuf of early childhood. Young children seem to move and vocalise a lot – and to do those things with a great deal of unpredictability! Is there a place then for teaching drama, movement and dance since children are already so expressive? I think that the answer is a strong yes. It is an essential part of “culture”. Drama, movement and dance are ways of communicating and ways of expressing. They are learned within a culture and their function is to give identity to that individual and that culture. I also think that we can and do teach communication and self-expression all the time and in various modalities. I’ve devoted my working life to drama, music and movement education because I find myself sympathetic to them as they are my dominant intelligences. The trick is to find the balance and to only “teach” when the learning point is right, when the child is in the zone ready to reach out and learn. So we need the right kind of activity and the right kind of stimulation, and we need to model what we want them to feel and do, but mostly what we want them to feel, because if they feel good they’ll want to do it. At your next opportunity, watch some children moving freely. Then plan to do as many drama, movement and dance activities as you can fit into your working day, just to remind yourself of how much fun it is to let your children and your own inner child act, move and dance. Stretched for time? 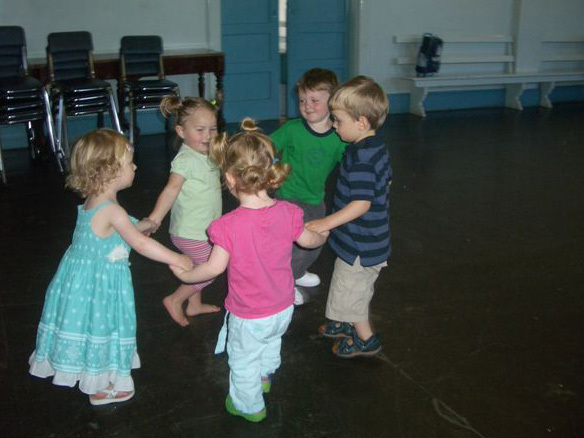 Over at Musical Child Early Learning through Music we have many drama, dance music and movement activities already prepared that come with their own music tracks and lyric charts. Save hours of preparation time and get inspired. Browse the drama and movement section or the games and dances section or the circle dances at musicalchild. I’d like to thank you for taking the time to share your insight and advice with regard to the importance of nurturing early childhood music & movement. I have a background in secondary education and taught middle and high school for several years. After resigning the public school system 11 years ago to raise my family, I have just recently taken on the role as music and chapel teacher at my littlest daughter’s preschool. It truly is an answered prayer and I am just loving it! I wish to further develop and enrich this preschool music program and personally gain more knowledge to better enlighten, nurture and inspire my itty-bittys. Your site and all the information it contains is a great start! Thank you for your kind comments and I’m glad these posts are helpful in your new work with young children. I know exactly the feeling of joy working with the youngest learners after years of teaching older children and adults myself. It’s like coming home.